International Journal of Research in Health Sciences,2014,2,1,195-200. 1-Post graduate, 2-Professor and Head, Dept. of Microbiology, Chettinad Hospital and Research Institute, Chennai. 603103, Tamilnadu, INDIA. Background: Klebsiella is one of the commonly encountered gram-negative pathogens in hospital-acquired infection. Multidrug resistance associated with the production of enzymes such as Extended-Spectrum Beta-Lactamases (ESBL) and carbapenemases are being encountered with increasing frequency nowadays, leading to very limited therapeutic options. Aim: To study the antibiotic susceptibility profile of Klebsiella isolates from clinical samples. To detect the presence and prevalence of ESBL and carbapenemase producing strains by phenotypic methods. Materials and Methods: 170 Klebsiella isolates from various clinical samples were taken up for the study. The antibiotic susceptibility testing was done by Kirby-Bauer disk-diffusion method. ESBL production was confirmed by Double-Disk Synergy Test. Carbapenemase producers were confirmed by Modified Hodge Test. Results: Out of the 170 isolates, maximum resistance was observed towards cefazolin (51.7%) and least resistance to imipenem (9%). 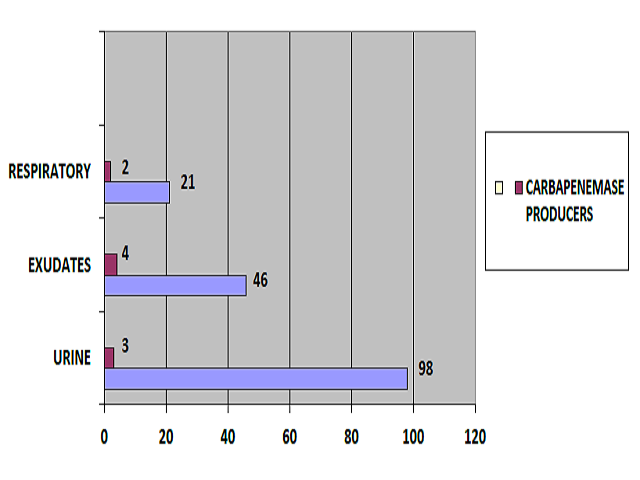 79 (46%) isolates were ESBL producers.15 isolates out of 170 (8.8%) were resistant to carbapenems. 9 out of 15 isolates (60%) produced carbapenemase enzyme. Conclusion: As the available treatment options are limited, antibiotic policies together with implementation of infection control measures are of utmost importance in the health-care institutions, to curb the rapidly increasing resistance rates of microorganisms.